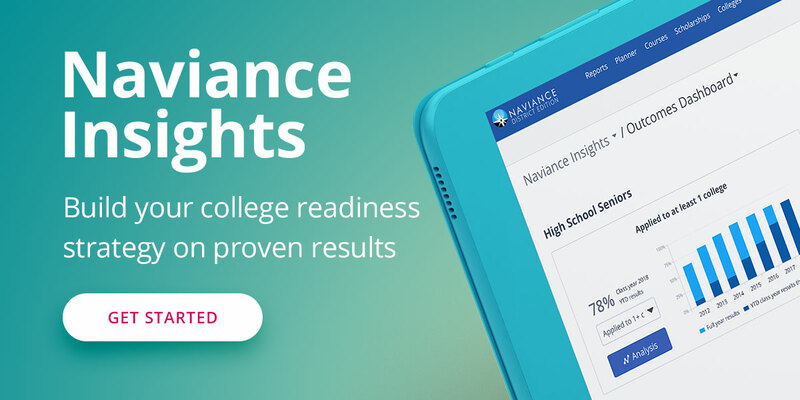 SuperMatch, a college search feature within Naviance, was updated this August as part of the new student-facing platform, Naviance Student. Throughout the 2017-18 school year, Naviance students conducted 36 million searches in SuperMatch. Over 20 new search filters were added to the tool, enabling high school students to more easily find their best-fit education institutions. New search filters include application deadlines, minors offered, online learning opportunities, average class sizes, tuition costs, support offered for learning disabilities, LGBTQ+ inclusivity, and more. The new SuperMatch college search tool makes it even easier for students to explore their options and discover colleges that are a fit with what they are looking for in a college experience and a match with their academic profile. Institutions matched with a student are now given a “fit” score for students to better understand how that institution aligns with the entered search criteria. Academic match results are provided with each matched institution to help students gauge if that institution is a reach, match, or safety based on their GPA, SAT and ACT scores. Onboarding modules enable students to have a self-paced SuperMatch experience. Over 50 tool tips are now included throughout SuperMatch to help students understand common - and not so common - college terminology.